Cornices such as this one at Crichton were common on ecclesiastical building of the medieval period. The Green Man was originally a pagan symbol but later absorbed and adapted by the Christian Church and given a new symbolic meaning. 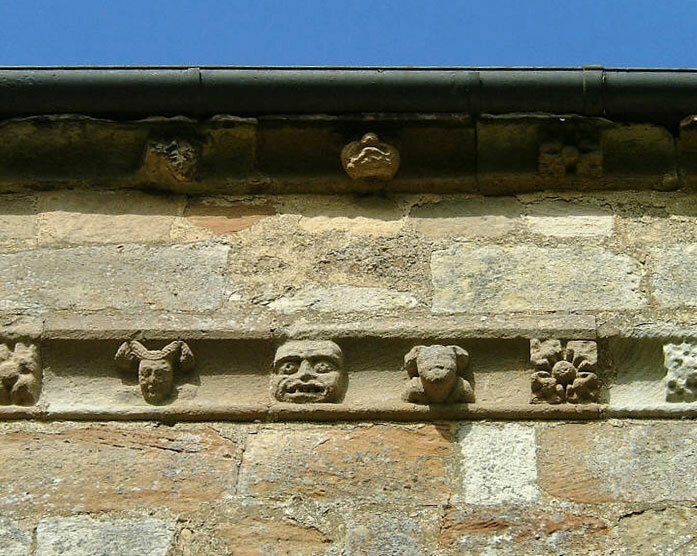 Grotesque faces too were originally pagan but the church adopted them in a similar way to the Green Man. They are presented as a warning – only good can come inside but the bad must remain outside the church (physically and spiritually). The human heads and floral motifs may have been simply decoration. As the Rosslyn Templars’ research continues there are a number of aspects which are beginning to reveal a ‘commonality’ between the Collegiate Churches around Rosslyn Chapel. One example is the Green Man already mentioned but simple architectural features are also beginning to reveal this ‘commonality’. The example on this page is the cornice. A comparison between (say) the cornices’ at Seton, Rosslyn and Haddington is thought to be an extremely interesting area of future research. Why? Well initial examination appears to show similar designs, styles and development. If true, that would indicate that a workforce of stonemasons had a general, overall, ‘repertoire’ for use in Scottish Collegiate Churches. As an example of the possible similarities between the cornice above and one at St Mary’s Collegiate Church click here. (Always remember to use the back button!). It has been suggested that we might wish to consider creating pages which bring together particular subjects on one page. Examples would be: Green Men, Templar Graves, Cornices’ (such as the above) etc. This is an interesting idea but as are still collecting information and images this would be a long term objective.